Not Tikis - They're Teekeez! Stackable 2 3/4-inch tall vinyl figures with a distinctive carved-from-wood aesthetic. Check out Batman, Superman, Wonder Woman, The Joker, and Harley Quinn! Series 1 display box contains 12 individually packaged figures. You've probably never seen your favorite superheroes and super villains looking quite like this! But aren't they cool? 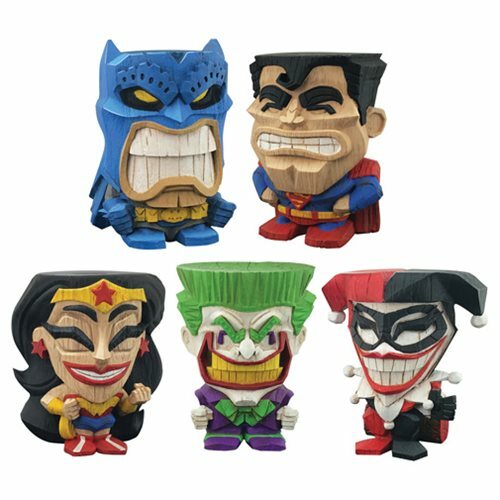 DC Teekeez Vinyl Figures are 2 3/4-inches tall, with a distinctive carved-from-wood aesthetic that's ideal for giving your home or office a relaxed kitchen vibe. The unique figures are stackable, allowing you to create impressive displays featuring Batman, Superman, Wonder Woman, The Joker, and Harley Quinn. Ages 14 and up. The DC Teekeez Vinyl Figure Series 1 Display Box contains 12 individually packaged vinyl figures.